13 September 2016, Geneva - in an unprecedented initiative CITES (Convention on International Trade in Endangered Species of Wild Fauna and Flora) and the CBD (Convention on Biological Diversity) joined forces to prepare their Parties for two major meetings of the Conferences of the Parties (COP) to take place in September and December. During the month of August, four joint regional meetings were held back-to-back – in Africa, Asia, Central and South America and the Caribbean, and Oceania – in the run-up to the 17th Meeting of the Conference of the Parties to CITES (#CoP17) and the 13th Meeting of the Conference of the Parties to the CBD (COP13) and the associated meetings of the Parties to the Protocols of the Convention on Biological Diversity. CITES #CoP17 and CBD COP13 are both being held at the end of this year, providing a rare opportunity for these regional joint meetings to be organized. CITES #CoP17 will be held in Johannesburg, South Africa and is going to be the largest and one of the most critical meetings in the 43-year history of the Convention, with a record number of agenda items and participants, and over 60 proposals for the amendment of the CITES Appendices. CBD COP13 will be held in Cancun Mexico in December this year, where Parties review their progress made towards achieving the Aichi Targets, among others, and focus on mainstreaming of biodiversity. "Over the years, the Secretariat has received requests to allow Parties to meet as a region in advance of the CoP to share information and exchange views on topics that were important for the region. Such pre-CoP meetings have taken place in some regions in the past, thanks to the individual initiatives of various partners," said John E. Scanlon, CITES Secretary General. "This is however the first time ever that the Secretariats of CITES and CBD have joined forces to roll out coordinated pre-CoP meetings across four regions, which has been of great benefit to our Parties in preparing for these critical meetings." The four meetings took place last month, which brought together over 100 countries in the four regions who are Parties to the two Conventions. The meetings consisted of CBD-CITES joint elements as well as parallel sessions to review the CoP/COP, and was designed specifically to allow Parties in each of the regions to determine the topics that were most important to them to develop the meeting agenda, prepare and give presentations, and share information and exchange views. 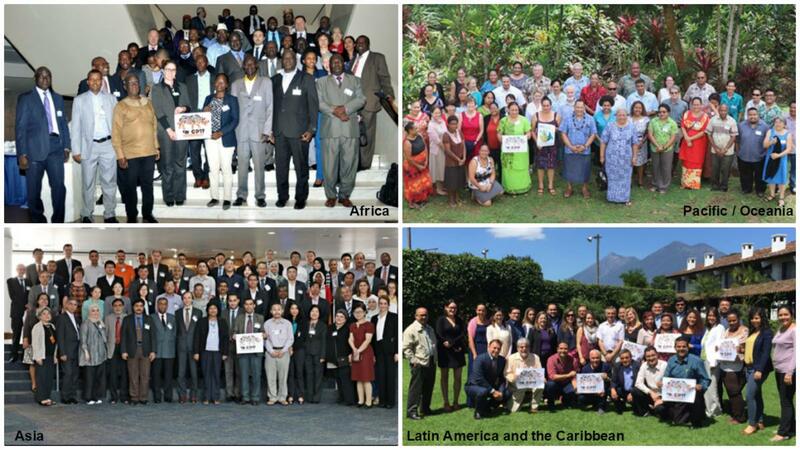 The meetings were organized in cooperation with regional partners, including the Secretariat of the African Ministerial Conference on the Environment (AMCEN), the Organization of American States (OAS), the Secretariat of the Pacific Regional Environment Programme (SPREP), and the Regional Offices of the United Nations Environment Programme (UNEP), as well as with the Standing Committee members of the respective regions. The other biodiversity-related conventions, including CMS and the UNESCO World Heritage Convention, also attended the meetings. This was an initiative of CITES in partnership with the CBD with financial support from the European Union. Further details, including documents and reports of the meetings, are available at https://cites.org/eng/pre-cop17_regional_meetings.